Mali Mish - Day 54: Milwaukee's Historic Third Ward. 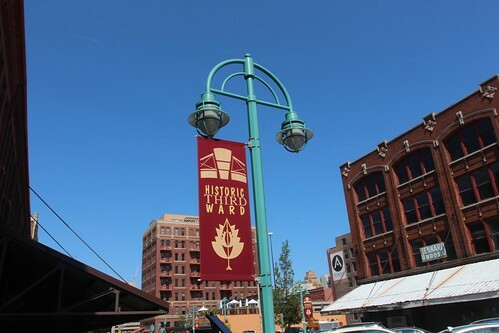 Our second day in Milwaukee took us into the Historic Third Ward. We have limited time here in Milwaukee so we are not getting to do as much exploring as we would have liked. There were a lot of great recommendations for this area and since it spans just a few blocks so it is very walkable for our little ones. The third ward is a neighborhood on the National Registrar of Historic places. This area at one time was a swampy, flat area. When the water was drained, buildings started to pop up and a neighborhood was established. It was initially a neighborhood of Irish immigrants. In 1860, a steamship left Milwaukee carrying many of Third Ward’s Irish immigrants. Unfortunately, the ship wrecked and sank in Lake Michigan taking over 400 lives with it. 30 years later, strong winds helped spread a fire that started at a nearby business that left 1,900 residents homeless. After the 2 devastating disasters, many of the Irish settlers left. Over the next 30+ years, the neighborhood was rebuilt and has become a predominantly Italian neighborhood. Today, the Third Ward is one of the greatest examples of successful urban redevelopments. 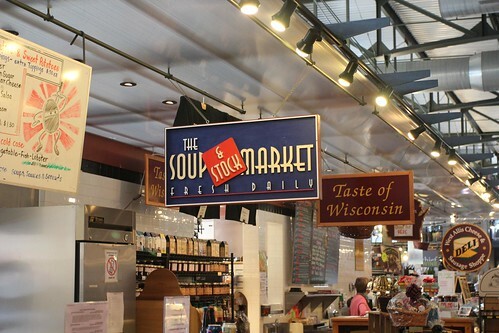 Today the Third Ward is home to the popular Milwaukee Public Market. We headed in there for lunch and also to do some school work with Ava. 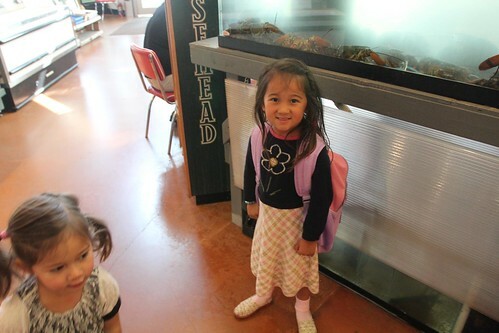 Ava was thrilled to actually walk around with her school backpack like a real kindergarten kid. 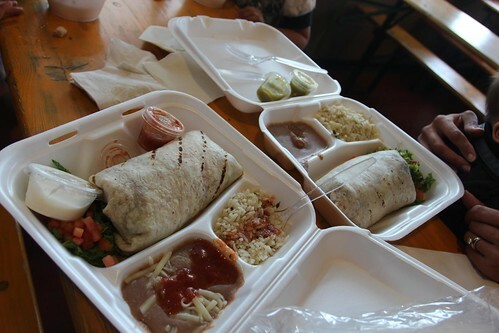 In the public market, there was everything from sushi, to Mexican food. We opted for burritos from Margarita Paradise while the girls shared a quart of chicken dumpling soup from the Soup & Stock Market. While not the most authentic Mexican food we’ve had, it was delicious. 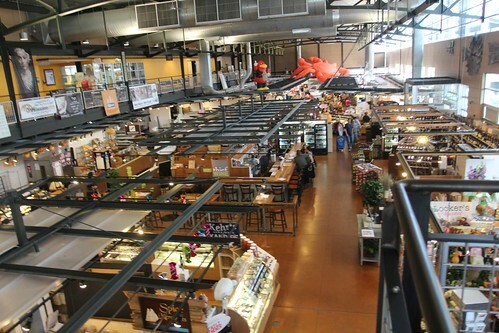 From the second story loft of the public market, you can see across the entire warehouse with all of the food stands and shops. 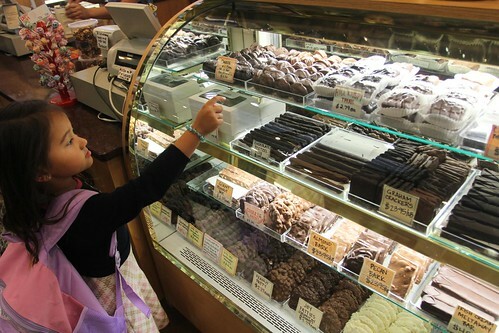 The girls couldn’t leave without getting something from the chocolate shop. 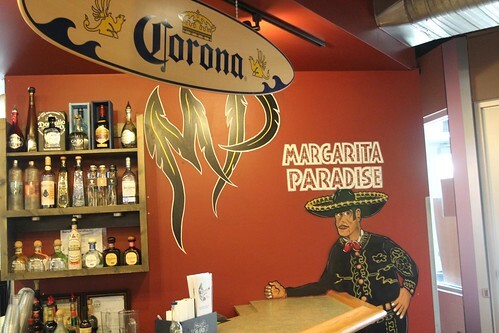 I was wondering why Marlene was so insistent on visiting the Third Ward of all of the neighborhoods of Milwaukee. 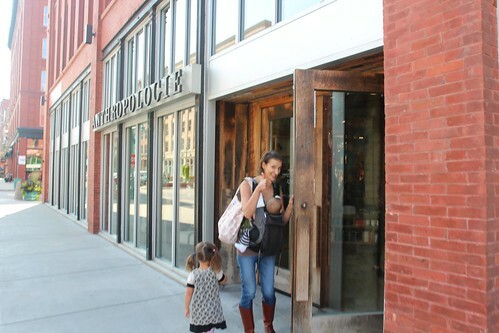 After lunch, it became clear, there is an Anthropologie here. All along the street, there are these shaded areas with picnic tables for people to sit and enjoy a nice day. We decided that one of these tables would make a great kindergarten classroom for the day. 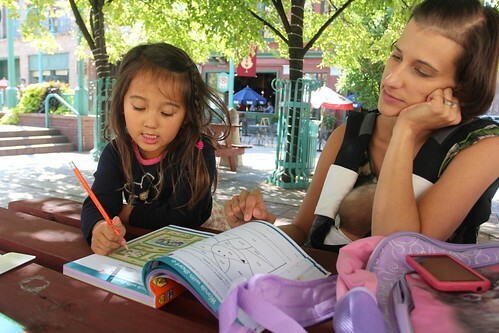 Ava is still very excited about doing her kindergarten work books. Marlene is also not as bored as she looks here. Although we didn’t do any other sightseeing in Milwaukee today, we did decide to stop real quick at the Pabst mansion briefly to at least take a couple of photos. 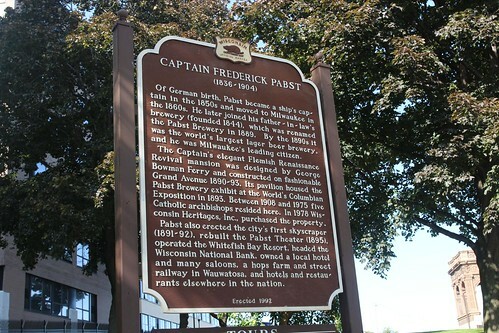 The Pabst family, of Pabst Brewery, lived here since construction was completed in 1892 until 1908. 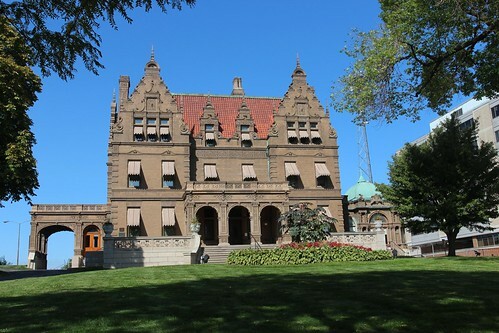 The Archdiocese of Milwaukee purchased the mansion and until 1975, many Archbishops, priests and sisters lived here. For 3 years since the Archdiocese decided to sell the mansion, it was slated for demolition in favor of a parking lot. Fortunately, Wisconsin Heritage, Inc., a historic preservation group, decided to purchase it in 1978 to restore it to its former glory and finally opened it up for daily tours in 1998. Our short visit to Milwaukee will come to an end tomorrow morning as we head south into Illinois and the Chicago area. Day 55: Driving through Chicago at Night. One Response to Day 54: Milwaukee’s Historic Third Ward and the Pabst Masion.